I will be showing a grouping of my oil paintings and line drawings this November at Steven Valenti's. Don’t miss the reception held during the First Fridays Artswalk on Friday, 11/2, from 5-8pm. I will be there to answer any questions and get to know everyone. This Friday, August 3rd, I will be holding a reception for my first solo show at the Lichtenstein Center for the Arts! Although I have had many solo shows in the past, none have been in a space quite this large. In preparation, I have made several new large scale paintings to fit the beautiful venue. As I am hoping to see many new faces at this reception, I will be giving a brief introduction to my work as part of the opening. The talk will start at 5:30pm, August 3rd, and I will be available the rest of the reception if anyone wants to ask questions one on one. If you cannot make the reception, the show will be on display from August 1st through August 31st, so make sure to stop in. Parking: Behind the Lichtenstein Center in the First St. Parking Lot. The Artful Mind Gallery is having a reception on Saturday, June 23rd 4-7pm. Since its opening in May, there have been several artists added to the roster and many of the works of art have been swapped out for the new month. This Saturday is a great chance to come see the space, artists, and new work. A lot of the artists will be there too, so this is a great chance to meet the creatives and pick their brains. The opening reception is on Saturday, June 23, 4-7pm. For more information, please email the gallery at: artgallenman@yahoo.com, or phone: 413.854.4400. Hours of operation are Tuesday through Sunday, 12-5pm and Mondays by appointment. Come in for a Nespresso and enjoy the art! Art of the Hills, June 2nd opening! I was accepted into the Art of the Hills exhibit opening this Saturday, June 2nd from 5:30-7:30pm. This is a juried exhibit of Berkshire based artists. With over 200 artists submitting, and only 36 chosen, I am extremely honored to be represented in the exhibit. I haven't seen the other works entered, but knowing some of the artists this looks like a fantastic sample of the best the Berkshires has to offer. And if one of my paintings isn't enough for you, stop by the Artful Mind Gallery at 22 Walker St., Lenox, MA for more of my work. New work every month through the summer! For more visit my earlier post. The Artful Mind Gallery Opening Monday, May 1st! I am pleased to announce I will be showing work in the Artful Mind Gallery in Lenox, MA from May through August. The gallery is brand new and will be showing the work of 17 artists, including myself. Stop in and see all of the amazing artwork the Berkshires has to offer! The Artful Mind Gallery, located at 22 Walker Street in Lenox, MA that opens May 1, 2018 will showcase an enthusiastic and finely tuned professional and passionate group of seventeen artists. About her decision to bring these artists together in this particular location, Curator Harryet Puritzman explains that, “if the space weren’t as beautiful and complimentary for artists’ work to be seen and swooned over, then I would never have considered taking on this very special project,” a summer gallery space in the heart of Lenox. The community and its visitors will be treated to the work of, Tyler Blodgett, Marguerite Bride, Roselle Chartock, Robert Forte, Susan Geller, Ghetta Hirsch, Karen S. Jacobs, Bruce Panock, Jennifer Pazienza, Edward Pelkey, Janet Pumphrey, Wendy Rabinowitz, Mary Carol Rudin, Sean McCusker, Scott Taylor, Robert U. Taylor and Robert Wilk. The artists at the Lichtenstein Center for the Arts in Pittsfield, MA, are having a group show of their work January 6-27th, 2018, with a reception held on Saturday, January 6 from 4-6pm and open studio following from 6-7pm. I will be displaying one new oil painting as well as three new silver ink drawings on board; a technique I have never tested before. Artists on exhibit include: Mario Caluori, Rick Casucci, Peg Dotchin, Julio Granda, Jim Horsford, Sean McCusker, and Michael Rousseau. After a year of planning, and painting, I am proud to announce my latest solo show on display at PUBLIC Eat + Drink. The show is on display from December, 2017, to April, 2018. PUBLIC is a fantastic restaurant located just down the street from Mass MoCA with beautiful brick walls to hang on. 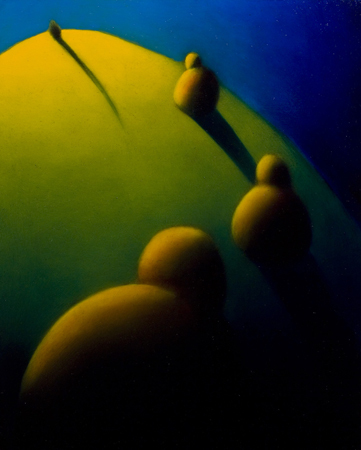 Stop by, have some food, and feed your soul with the latest of my oil paintings. For this show I completed six new, two foot square, paintings making the main dining area a large cohesive exhibit. The square format is a difficult one to balance and I used this notion as a challenge in creating each of these works of art. I am proud to be a part of PUBLIC and prouder of the latest creations born of this opportunity. Please check out the exhibit and let me know what you think about the new work. Not enough to get you out to North Adams? Well, this establishment had plenty of space for more work so filling out the space are selections from past exhibits including older oil paintings as well as pastel and silver pen drawings. As always, all work is for sale! Along with Morris Bennett and Anne Roland, I will be participating in a Pop Up Gallery in Pittsfield this December. The opening will coincide with the First Fridays Artswalk on December 2nd from 5-8PM. I will be showing my energetic silver pen drawings and colorful pastels. I also have some older work in this show including remnants of The Journey series and a set of prints I had made for those works. The holiday season has also filled me with generosity and so everything in this show is on sale! Is there a better way to kick off the new year than with an art show? Probably, but it sure isn't a bad one! Opening Reception: Saturday, January 8, 4-6pm. I am having my annual show at Steven Valenti's this November! I will be showing some of my latest paintings, their actually drying in the studio as I type, as part of the First Fridays Artswalk. If you were able to come to any of the painting demos I gave this year, you will recognize some of them. Please stop by this Friday, 11/6, for the reception and let me know what you think. Details: Steven Valenti’s Clothing for Men, 157 North Street, Pittsfield, MA. The exhibit will be on display from November 5 to November 28; with a reception held during the “First Fridays Artswalk” on November 6th from 5-8PM. My latest exhibit Elegant Line is on view at Deidre's Special Day in Pittsfield, MA. The show will run from June 3 to June 27 with a reception held during the First Fridays Artswalk on June 5th from 5-8pm. For this exhibit I am showing my line drawings which are seldom on display outside of my studio. There are a couple of Conté drawings in the showing but the focus of the show is on my silver on black line drawings. You will recognize the themes in these works, but the lack of color and unmasked line gives these works a gesture and movement that is not as forefront as my oil works. I'm very excited for this exhibit and do hope you have the opportunity to come tell me what you think of it during the reception on Friday, June 5th. If you can't make it to the reception, feel free to comment on this post, I'd love to have your the feedback! DEIDRE’S Special Day has been serving the Pittsfield community since 2001 by providing the best in dresses and accessories for all occasions, and in that time has made a name for itself through top notch customer service. Although well known for their wedding and prom attire for over 13 years, DEIDRE’S also provides the best selection of non-bridal dresses and accessories in Pittsfield. Having just recently opened their new “Social Butterfly” department, DEIDRE’S is excited to showcase their new line of non-bridal related attire, featuring party / cocktail dresses for all occasions. DEIDRE’S is located at 2 South Street across from Park Square, Pittsfield, MA. For more details, including hours of operation, please visit www.deidresonline.com. 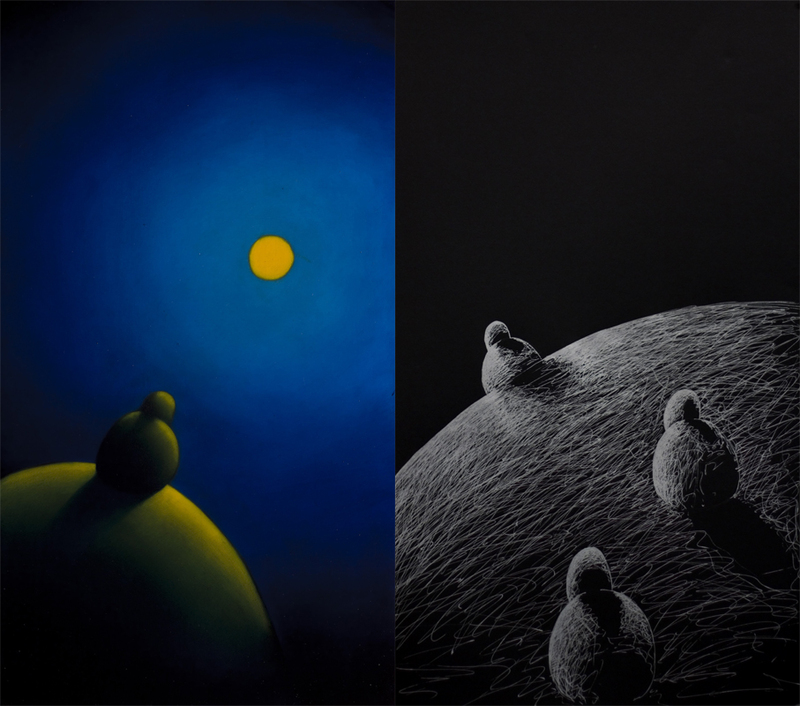 “Elegant Line” will be on display from June 3 to June 27, 2015. Another month means another First Fridays Artswalk and this month I'm in it! My work will be on display at The Whitney Center for the Arts in Pittsfield, MA, along with Michael Rousseau and Douglas Paisley. I have ten paintings on view both new and old including my rarely displayed large paintings. The show is having its opening reception on Friday, May 1st, from 5-8. The artswalk also have an after party hosted at The Whitney, so if you're late, you can still come have a good time at the after party. I hope to see you there! I also recommend seeing the show at Valenti's (which I curate) featuring Tony Conner; to plan your artswalk you can download the map for this month here. Gallery Hours: Wednesday through Friday from 4-7, Saturday 12-5 and by appointment. Reception: Friday, May 1, from 5-8pm. Location: The Whitney Center for the Arts, 42 Wendell Ave., Pittsfield, MA 01201. We’re having a group show for all of the artists who have studios at the Lichtenstein Center for the Arts in Pittsfield, MA. The show is called Out of the Studio: the Artists of the Lichtenstein and features me and 7 of the other artists there. There is also an article on it in the Berkshire Eagle; just click here. I will be showing some of my latest work; if you attended any of the painting demos I gave last year you will recognize some of the paintings. Please come say hello during the opening reception on Saturday, January 10th from 4-7pm, where there will be live music and refreshments. Opening Reception: Saturday, January 10 4-7pm. I hope you to see you there! I will be demonstrating my painting techniques on the grounds of Frelinghuysen Morris House & Studio on Friday, August 15th starting at 11:00AM. There will be several examples of my work and examples of those in progress. If you have ever wondered how I produce the translucent paintings I am most known for, now is your chance to see them being made. The demonstration is free with any admission to the museum. I hope to see you there. Frelinghuysen Morris House & Studio is a modern style house museum built by two abstract painters most known for their work in the 1930s and 40s when they were pivotal in the development of abstract art in America. Beyond helping develop American abstract art, they were also avid collectors of modern paintings including work by Braque, Picasso, Gris, and Leger. The house is open, by hourly guided tours only, from 10-3 Thursday through Friday. I highly recommend it to anyone interested in the arts. If you happen to be in the Pittsfield area this 3rd Thursday, July 17th, come on over to the lawn of St. Joseph’s church. I will be there inside a giant tent along with 9 other artists who will be selling work inside along with hors d’oerves from Mission and a cash bar! This is a pay for admission event, $5 per person to benefit the Pittsfield Shakespeare in the Park. So come on by and see the cast of A Midsummer Night’s Dream and then check out some of the best art in the area! This is a one day event held on July 17th from 5-8PM. The tent will be located in the lawn of St. Joseph’s Church, 414 North St, Pittsfield, MA. During the event North Street is closed to vehicle traffic so everyone can walk the entirety of North Street; so plan carefully. Sean McCusker will be showing his colorful surreal landscape pastels at DEIDRE’S, 2 South Street across from Park Square, Pittsfield, MA. The show entitled “Pastel Stories” will be on display from June 6 to June 28; with a reception held during the “First Fridays Artswalk” on June 6th from 5-8PM. 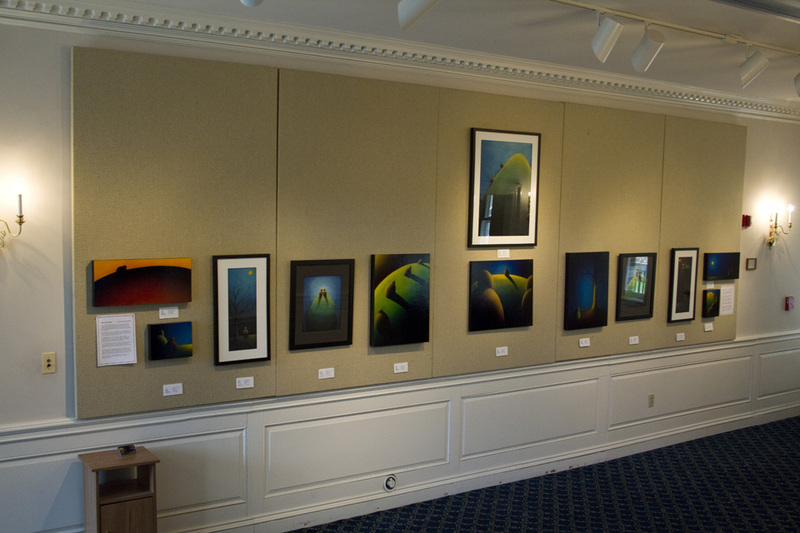 I have some paintings on display at the Adams Town hall in, as you may have guessed, Adams, Ma. There is no reception, but the work is right out in the open and you can visit during any of the regularly scheduled hours: Monday – Friday 8:30 AM to 4:00 PM. The show will be on display through June 25th, 2014. Take a look at the show and let me know what you think. All of the work is also for sale, so feel free to contact me for prices. The Adams Town Hall is located at 8 Park Street, Adams, Ma 01220. I have two paintings that will be on display at the Welles Gallery in Lenox Massachusetts as part of the Housatonic Valley Art League's Small Works show. The opening reception is Saturday, 10/5/13 from 4-6. Come on in and see me and my work as well as the other talented artists of the HVAL. This is an annual show, which I have missed for the last couple of years, and has always been an excellent exhibit. Just because the work is small does not mean they are any less intense. In fact, I feel that the intimacy of small paintings can bring more to the experience because you have to be in such close proximity to it. I hope you are able to see the show and feel free to comment here about what you think of it. The show will be up from Thursday, October 4 to Saturday, October 26, 2013. The gallery is open Thursday - Sunday 10-5 and will be open on Columbus Day, 10/13. The Welles Gallery is located in the center of Lenox attached to the Lenox Library: 18 Main Street, Lenox, MA 01240. Since you’re here I presume you are interested in my artwork. If by chance you are also in the Pittsfield area in May 2013, you are certainly in luck as I have a show up at the Treehouse Children’s Boutique at 305 North Street in Pittsfield. There you will find around 20 works on display including oil paintings and pastel drawings. You say you want to purchase some of my art? Well, someone has kissed the Blarney Stone, because as a special promotion for the show I am giving a $100 discount on any purchases made during the opening reception held during the First Fridays Artswalk on Friday May 3rd, 2013, from 5-8PM. Many of the works you can find on my website will be there and many more that have not yet graced the internet. Following is the official press release with all the important details. I hope to see you there! Sean McCusker will be showing his colorful surreal landscape paintings at Treehouse Children’s Boutique, 305 North Street, Pittsfield, MA. 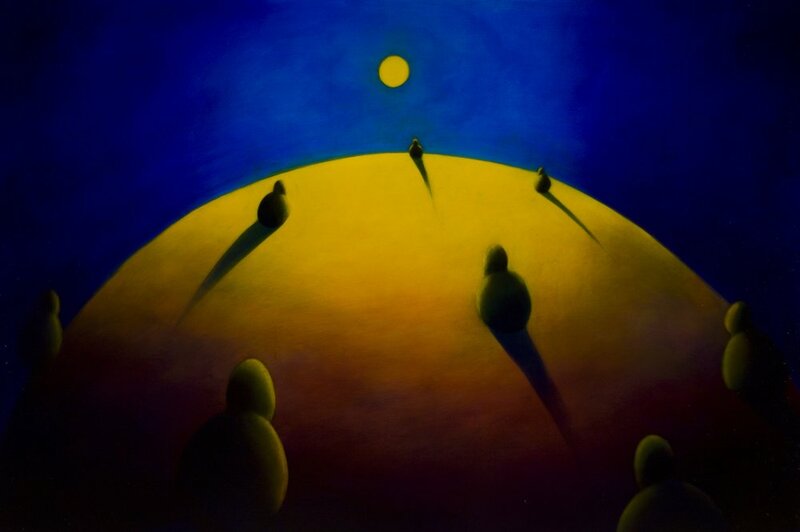 The showing entitled “Landscape, Color and Me” will be on display from May 3 to May 31; with a reception held during the “First Fridays Artswalk” on May 3rd from 5-8PM. Treehouse Children’s Boutique will be showing the work of Sean McCusker for this May’s First Fridays Artswalk. Sean McCusker has been creating surreal landscapes inspired by the hilly Berkshires for the past 10 years. His work has been shown at galleries and storefronts across Berkshire County and he has been an active member of the arts community in Pittsfield offering his experience to the First Fridays Artswalk and other cultural organizations. 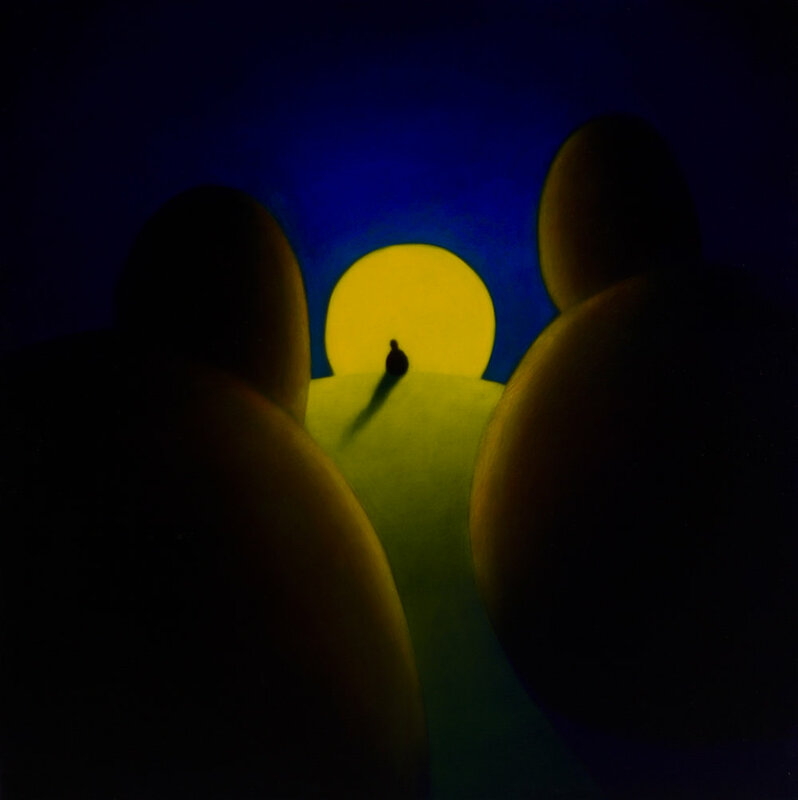 This show will highlight the development of the settings and characters he uses in his imaginative paintings. From his dark and mysterious early work to newly completed paintings full of bright color and vibrancy, you can experience the development of the now iconic characters and scenarios that have become indicative of his work. Sean's abstract compositions glow with an intense color and contrast that is built up from many thin layers of transparent oil paint. His compositions use striking color to intensify the thematic landscapes; color describes and animates the surreal world. The compositions often center around an abstract figure, sometimes in a group but most often alone, set against a vast empty space. These figures brim over with warmth, along with a deep yearning for that which is just over the horizon in their richly colorful world. 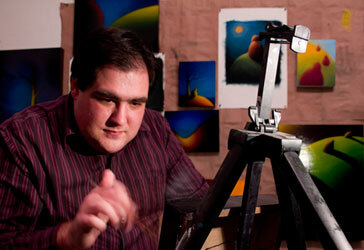 Examples of his work can be found at www.sean-mccusker.com.